George A. Chatman, of Detroit, died September 23, at the age of 66. Judge Chatman was a 1982 graduate of the University of Detroit Mercy School of Law and was appointed a judge of the 36th district court in December 2010. He is survived by his daughter Sharyl. Visitation is on Friday, September 30, from noon-9 p.m. at Swanson Funeral Home, 14751 W. McNichols Rd., Detroit. The funeral service is at 11 a.m. Saturday at Tabernacle Missionary Baptist Church, 2080 W. Grand Blvd., with a family hour beginning at 10 a.m. In lieu of flowers, the family encourages donations to the Judge George A. Chatman Scholarship Fund, P.O. Box 2721 Southfield, Michigan 48034. PMRC Tip of the Week - Have an iPad but Can’t Use It? So you went out and bought an iPad and now you are flummoxed trying to understand how it works. While it appears that very little documentation comes with an iPad there are a couple of surprisingly robust resources available if you have access to the Internet. Using the Safari browser on your iPad click on the Bookmark icon. The iPad User Guide bookmark is preloaded and listed in Bookmarks. Simply click on it and you are linked to a comprehensive online source to help you master your iPad. A second option is the complete PDF user manual available from Apple. This document is a 16 MB, 198 page, comprehensive manual which may take a few minutes to download. Once it has downloaded to your iPad, touch the screen in the upper right hand corner and you will have the option to open the User Guide in iBooks. Once saved into iBooks it will be at the ready whenever you need it regardless of Internet availability. Every week, the Practice Management Resource Center posts a new Tip of the Week. (Here are the archived tips.) To reach a practice management advisor, call the PMRC Helpline at (800) 341-9715 or e-mail your questions to pmrcHelpline@mail.michbar.org. Bitter Lawyer nails it. I confess to only one. In a story headlined "Wis. Supreme Court Justices Agree to Play Nice," the AP reports that the Wisconsin Supreme Court, which frequently fails to agree on much and occasionally disagrees notoriously, unanimously adopted the following statement on Wednesday: "We duly affirm our commitment to collegiality and collaboration in the manner we work together the bulk of the time." The import of the qualifying term "bulk of the time" was not explained. According to the story, Justice David Prosser "seemed tempted to vote against it but raised his hand after he saw the other justices voting in favor." Law school applications are down almost 10%. LSAT summer takers were down 18.7% -- the biggest drop in at least 24 years. 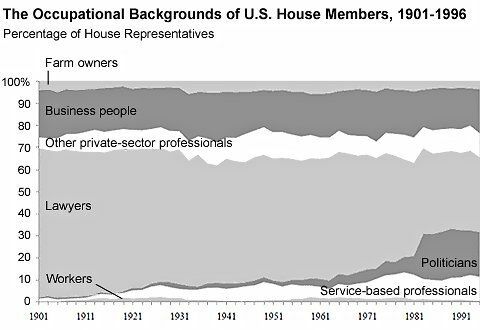 With the exception of a modest increase in the percentage of representatives classified as career politicians in the early 1980s and a corresponding drop in the proportion of lawyers, the occupational makeup of the House changed surprisingly little during the 20th century (despite seismic changes in the composition of the American workforce). For most of the last hundred years, between one and two thirds of representatives were lawyers. Can You Be Fired For Being Obnoxious? Berry ... argues in his brief that Kasowitz Benson's response to his email was "outrageous and extreme" compared to how another law firm would have handled the situation and contends that he is hence entitled to compensation for emotional distress, the article recounts. His lawsuit seeks $77 million in damages. "The context of the legal profession ... perhaps more than any other, is one of civility and decorum," Berry writes.. "In this context, the aggressiveness and the overt hostility, vindictiveness and pettiness to which defendants subjected plaintiff were shocking." The law firm has denied his allegations and says Berry's suit is precluded by a $27,000 severance pact to which he agreed. He is, the firm contends, in "flagrant breach" of the once-confidential settlement agreement. Characteristically, Above the Law is all over the case. Before his career in the law, Mr. Berry worked for several years as a software engineer in Silicon Valley. He graduated from the University of Pennsylvania School of Law and began his legal career at the "big-law" firm of Kasowitz, Benson, Torres & Friedman. He quickly discovered that the emphasis in "big-law" firms on generating billable hours rather than on applying creativity and intelligence to devising unorthodox and cutting-edge legal strategies left Mr. Berry wasting his talents. Mr. Berry became a lawyer to fight for justice and to use his powers for good. He started this law firm to lend his abilities to clients who need the highest legal talent possible. Alternative A is the current version of MRPC 6.1 with the addition of proposed language that would clarify that lawyers would not be subject to disciplinary action or any other process to enforce their responsibility to provide pro bono services. Alternative B, modified slightly by the Court for publication, was submitted by the State Bar of Michigan Representative Assembly, and is based largely on the American Bar Association’s Model Rule of Professional Conduct 6.1. The proposed amendments would clarify that each lawyer has a responsibility to provide pro bono legal services, and would establish in the Michigan Rules of Professional Conduct an aspirational goal for a lawyer to donate 30 hours or handle 3 cases per year, and/or make a financial donation of $300 or $500 per year. The requirements are similar to the existing standard adopted by the SBM Representative Assembly in 1990, which recommends Michigan lawyers provide civil legal services to three clients, provide 30 hours of service, or contribute $300 to programs providing civil legal services to the poor. The proposal would create a professional responsibility for lawyers that would require them to provide legal services to those of limited means, but would state in the rule that the responsibility to do so is voluntary and not intended to be enforced through a disciplinary process or by any other means. The must haves? The Lawyerist rounds them up. The short version: picture, pitch, path (J.D., plus), and punch (bells and whistles, like twitter or video). In my view, the ability of Congress to accomplish the functional equivalent of the mandate under its undisputed powers shows why the challenges to the law are misguided. These challenges rest on the empty formalisms of labels and for that reason, they should be rejected.